Justin Bieber has been dominating the charts with an unprecedented string of bangers and will be taking his number one album Purpose on a global tour next year. Tickets for his string of UK shows go on sale at 9am on Thursday 17 December, so bookmark the date in your diaries now (helpful tip: it’s the same day Star Wars comes out). Biebs will play two nights at the O2 Arena in London in October 2016 before heading to Birmingham, Manchester, Sheffield and Glasgow. 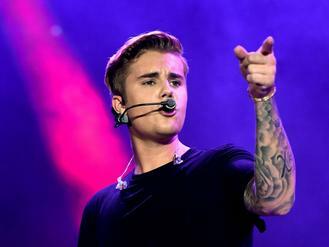 The 21-year-old has beaten a series of records during his comeback, beating The Beatles and Drake by having 17 songs in the Hot 100 in one week and racking up more than 200 million Spotify streams of Purpose in its first week alone. Members of pop rock band 5 Seconds of Summer are not at all interested in giving each other gifts for Christmas. Nicki Minaj has upset the Human Rights Foundation charity by going ahead with a concert in Angolo. Cheryl Fernandez-Versini will record new music in 2016. Ariana Grande has released a surprise Christmas album called 'Christmas & Chill'. AC/DC are bringing their 'Rock or Bust World Tour' to Europe in 2016. Legendary Australian rockers AC/DC have announced some European tour dates, including two in the UK in June. Rihanna is still looking for songs for 'Anti', says Sia. Muse Named As New Bookies' Favourites To Headline Glastonbury. Madonna blasted her fans after she was an hour late to her own concert in Manchester on Monday night (14.12.15). Justin Bieber has been dominating the charts with an unprecedented string of bangers and will be taking his number one albumPurpose on a global tour next year.